European equities are set to start with gains as traders dust off the US storm clouds and get back to economic fundamentals. Overnight, China's GDP figures showed a steady growth rate coming inline with expectations. However, it's been a tumultuous week and traders have had to endure some hefty volatility. So whilst we've already seen equity indices register reasonable gains, risk appetite may be nearing satiation for this week at least. Also, with the 'missing' Non Farm Payrolls possibly scheduled in for next Tuesday, traders may feel the need to recharge their batteries before the 'will they, won't they' tapering fun begins again. So how has the Dow Jones faired in what investors are calling 'the morning after'? Well, since the cash open yesterday, the Dow Jones has rallied more than 130 points. With further progress overnight, Dow futures are sitting pretty at 15,385. However with some poor quarterly results from some of the big muscle companies, will investors turn bearish on this market once the troubles from Washington are forgotten? Either way, the ideological battle between the Republicans and Democrats still remains and the solution is no more than a temporary winter truce. Expect the fighting to resume just as vehemently in the spring. Until then though, markets can get back to their Fed tapering induced bipolar disorder. On a day where the Senate has finally passed a measure to end the fiscal impasse, one might have expected the Dow Jones to gain in confidence. However, since the UK cash close, we have seen the opposite. After reaching a one week high of 15,374, the Dow is now 70 points lower at 15,304. With the US economy now safe from a financial default, the fall in the US Index is a little surprising. Zero hour is fast approaching and we are expecting a peculiar open in Europe. One possible explanation could be that some are seeking the fiscal sanity of the Germans while the US decides whether or not it wants to implode. Fitch's warning that they could strip the US of its AAA rating overnight hasn't really had an impact. To leave it this late in the saga to chime in with the possible repercussions probably says more about the last minute culture that is taking hold over there. In what is probably comparable to the financial equivalent of the Cuban missile crisis, there is very little one can do to determine whether or not we will hit the wall. Let's just hope that the threat of mutually assured destruction sees saner heads prevail once again. Yesterday saw large fluctuations and volatility in the stock markets; comparable almost to the stop-start negotiations in the Senate. The Dow Jones initially fell as there was no negotiation in sight, however, there was a glimmer of hope towards the end of the day as talks resumed. We then heard that the House of Representatives will bring a new plan to the floor for a vote and, with this new hope, the Dow gained some momentum to close at 15,220. The last couple of weeks have seen bulls stopped out of their longs as the icy relationship between the warring sides ground markets lower. However, the sudden u-turn in sentiment has seen the bears blindsided as markets challenge their annual highs. It's telling of how dysfunctional markets have been when the best performing traders may have been those who were paralysed by the severity of the situation into doing nothing. Although a world does exist outside the US, and the media has been known to report on it from time to time, the markets have paid barley any attention. The Dow Jones rallied last night amid growing hopes that a resolution will soon be made concerning the government shutdown. US stocks fell during the early part of the session, but turned higher throughout the afternoon following news that President Obama and Jo Biden would meet with Congressional leaders. Even though the meeting was postponed, the Dow remained at its highs and even broke through the 15,300 mark. However, against the back drop of gains on Thursday and Friday, we're only seeing a modest retracement and there is still an overwhelming belief that a deal will be reached before default day. Unfortunately, this belief is based on hope rather than evidence and is only supported by the 'it won't happen because it would be really bad' logic. Nevertheless, when a democratically elected government starts acting like a bureaucratic collective, the odds of a default don't seem quite as far fetched. As each day passes without any actual progress, the market is likely to continue to price this in and we could start to see larger downside moves and greater volatility. US stock market futures are pointing towards a lower open today on reports that Senate leaders remain deadlocked over a debt limit deal due to a clash over the sequester budget cuts. 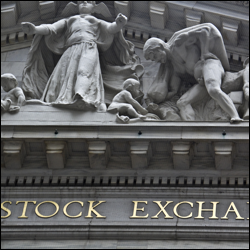 The Dow Jones fell 0.7% to 15,074 but has remained steady if not rallying slightly.